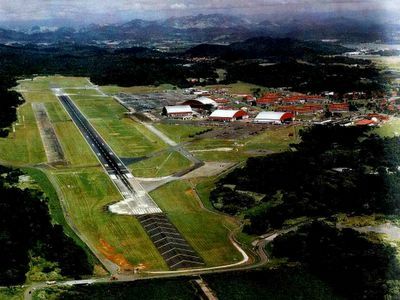 The State Department's Panama Desk and its embassy in Panama City are both watching Friday's sale of mothballed Howard Airforce Base with concern ... but not too much concern. "We don't see an air strip as a possibility, and neither does our embassy. If it were, it would be a concern," Greg Schiffer of State's Panama Desk told me today. He acknowledged that redevelopment plans for the property could include its use for air transport purposes, but "not as a military base." One hopes that Schiffers' calm exterior is matched by some behind-the-scenes hard discussions with the Panamanians regarding who should get Howard, and how their use of it should be controlled. Howard has a proud history of service, particularly in the drug wars, where it was a base of operations for missions to interdict drugs and "aerially manage" coca crops -- this underscores its strategic importance in a part of the world that is critical to our safety and security. Howard spent longer on the base closure list than any military facility ever, another indication of its strategic importance. For it to fall into China's hands remains unthinkable, despite the reassurances from Schiffer. This Friday, we'll know whether the Communists got it. Let's hope not, but with China operating both canal port facilities, betting money would be on the Chinese at this point, unless State works some magic. Whoa! I'm A Large Mammal!